i’m not a label-lover. really. i own some of the good stuff, but not because i intentionally bought the label for the sake of buying the label. and if that’s you, there’s nothing wrong with that – to each her own. we each have our preferences and i’m not in any position to say there’s a right or wrong. as for me, generally i love clothing and shoes if they are well-made and classic. i shy away from most trends, maybe because they scare me or maybe because i just can’t effortlessly pull it off like some of you fashionistas out there. i tend to like clothes and shoes that are dependably chic season after season, year after year, and i don’t care who makes them – just as long as they are made them so well that i don’t have to buy another version of it in the next year. christian louboutin sits next to enzo angiolini in my closet. volcom hangs next to brooks brothers. it’s a mix-y melting pot of anything that i happen to like. i explain this to you because i am trying to rationalize my lust for an iconic purse that is overpriced. but beautiful. and ladylike. and quilted (i love quilted things). and lusted after by many a label-lover. it’s just so classic and the chain is so feminine but it’s a powerful sort of feminine. take-over-the-world feminine. do you get what i mean? 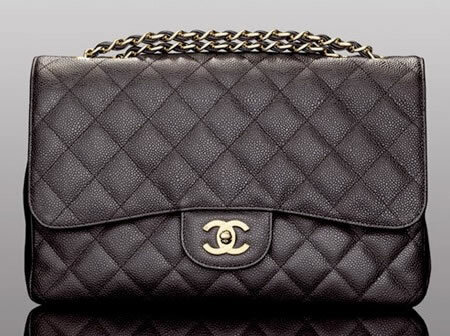 you will be mine someday, chanel purse. mine forever.